Before I say anything about the event – let me say this : Big thanks to Mike Prosceno, Mark Finnern, Aslan N, Stacy Fish, Craig Cmehil and Andrea Kaufmann . Without them – I would not have had the awesome experience I had. THANKS !!! So here is the report out – and as always, like all my blogs, this is just my personal view and not of my employer. Here I am at Orlando Airport at 5AM, on my way back home from PHX. As always, it was a lot of fun to catch up with all my buddies from all over the world. This year was extra special since I had the pleasure of meeting the other 3 SAP Mentors from IBM – Somnath, Dipankar and Abesh at SAPPHIRE. Quite a nice way to celebrate our Pinnacle Award . I wore 3 hats to SAPPHIRE – as an IBMer, as an SAP Mentor, and as a blogger. I had to work at the booth, meet customers and introduce them to all the cool things SAP is bringing to market. We had spent some time building our demos for BI/BO and it was gratifying to see customers and SAP appreciating that. As a mentor, I got the new mentor tie which I proudly sported all of Monday.Thanks to my friend Beverly Tomb for the photo. And on evenings – except for Sting concert, I traded the suit and tie for the mentor shirt. I could not attend all the Mentor meetings Mark Finnern so kindly arranged. There just wasn’t enough time, and my schedule was quite out of hand. I could clearly see how much visibility the mentor program has now compared to when it started. This was the first year I went to SAPPHIRE as a blogger. SAP paid my airfare and hotel to attend SAPPHIRE. Getting a room at the Hilton, which was connected to the convention center was quite nice. Best part was we had a great place in the 19th floore executive lounge to shoot videos with Jon Reed and Dennis Howlett – the forces behind the excellent JD-OD.com venture. On Monday afternoon, I had a chance to meet with George Mathew, an executive in the BO side of the house. I already knew George from before via phone, email and twitter – so it was easy to get right to business on topics of interest – specifically mobile BI or MOBI. He is quite articulate, and I believe will rise much higher in his career. Not just George, I met several other executives this time that gave me the impression that SAP has great bench strength to keep feeding the leadership pipeline. It is a big deal – well done SAP. OK – so back to MOBI. SAP bought BusinessObjects and Sybase, but SUP and MOBI are not integrated , and I had asked that question many times before. George tells me that this will happen towards end of this year. I think it is a pre-requisite for SAP to scale its mobility offerings. The other major questions – which both John Appleby and I had for George, was offline analytics and agile BI. For offline – SAP has some offline features in MOBI today – which will be available to customers soon, which George demonstrated on his tablet. However, there is still a gap – there is no solution today where by a user can get a dataset downloaded to his laptop or other mobile device, to analyze offline – say during a plane ride. SAP is fully aware and working on it according to George. There wasn’t a clear answer on the Agile BI thing . George did say SAP has no plans to buy an existing vendor to get over this gap. We asked George about how the smaller companies will make use of BO suite – since the pricepoint is not very friendly for those customers. I don’t think we got a crisp answer on what SAP will do to change it, although it was amply clear that they understand the challenge. The prebuilt analytic apps that came out from Keith Costello’s team will all get repurposed to work on HANA. This is great news – and I am looking forward to understanding how the existing BAS architecture will morph into one that HANA can use effectively. George confirmed that SAP did not find any performance degradation with the new common semantic layer. I am sure that is a great piece of news to a lot of customers going to the 4.x versions of BO. More over, the long term plan is to get rest of SAP suite , including OLTP applications to work with common semantic layer. We finished the official part of Monday with a recap video session that Dennis recorded with me and Harald Reiter. Dennis is quite professional in his video production. Next time, I should learn a few tricks from him. Pls check out http://www.jd-od.com for exceptional videos on demand. Some of you might have heard that my employer, IBM, won the Pinnacle Award for Community Leadership and Social Commerce Engagement . I saw the award displayed at the IBM booth – and it looked pretty cool. We have 4 SAP mentors at IBM, and all of us were at SAPPHIRENOW and we took a nice picture of all of us, with Beverly Tomb taking the photo – who many know as @IBMSAPAlliance on twitter. I am not wearing the mentor shirt, but I was wearing the mentor lemon button on my coat lapel. Although I did not see the Award being presented to IBM, Mark Yolton assured me that he took excellent care of the IBM executives SAP invited to the event. Thanks Mark ! 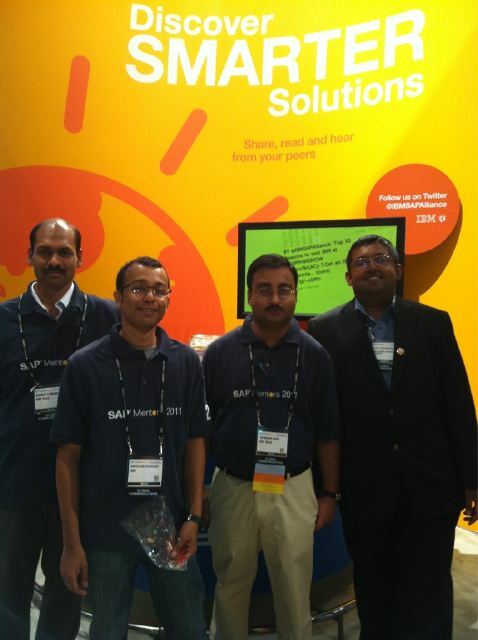 Previous What do I expect to learn at SAPPHIRENOW 2011? 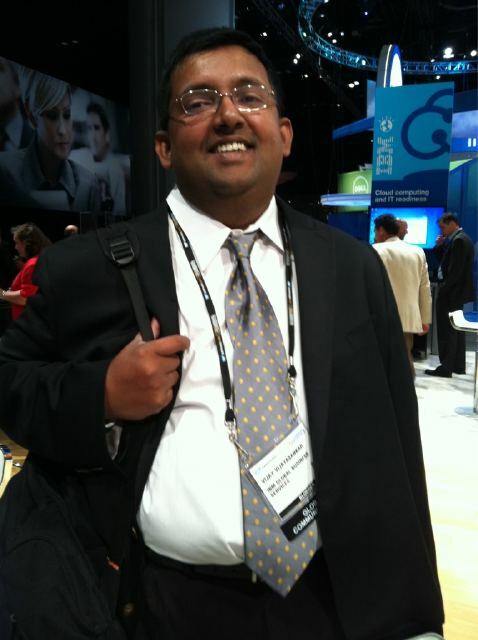 Vijay – it was great finally meeting you in person as well as many other SAP Mentors. Good to know many others did not catch much sleep over this week – not alone! It was indeed a fascinating event and only now realised how soon the time passed by. Overall good summary of the keynotes – I was bit disappointed that there were no major announcement, but there as you mentioned now its time for SAP to execute the vision shared. About our offline BI capabilities: There is a solution for business users interested in working offline say in plane or at the cottage: It’s Web Intelligence Desktop Edition. As the name suggests, it is for the PC, not a tablet or mobile, but it provides the ability to work on a report or analysis in a connected or disconnected mode. You could even sync report/analysis if desired when you’re back from your weekend at the cottage. The issue I am refering to is the ability to not just report online, but also get medium size data sets downloaded and kept in sync with server. Great recap, Vijay! It was a pleasure meeting you in person for the first time, and I look forward to many more opportunities to come.